The Dormition Abbey, also known Dormition De Maria Abbey, was built as a memorial to the rise of Mary mother of Jesus to heaven. 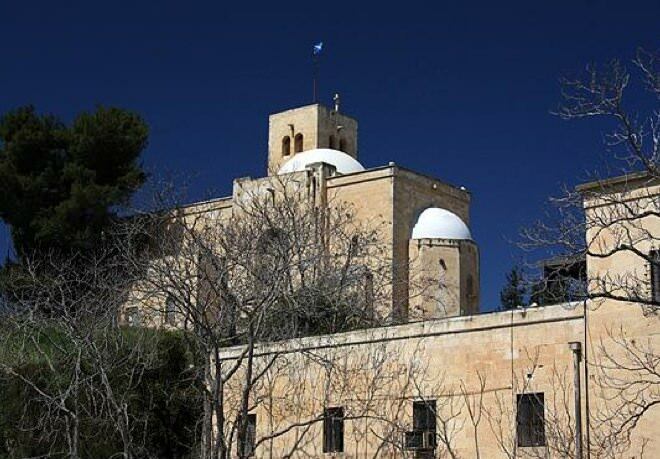 According to the catholic tradition, Dormition Abbey is where Mary fell to eternal sleep and went to heaven. 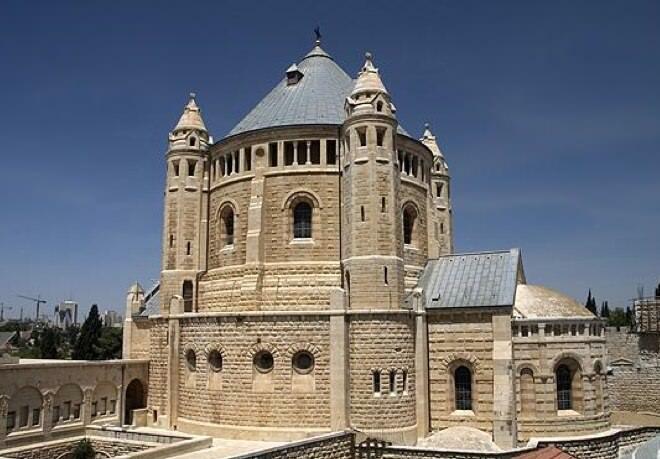 The church was built after the German emperor Wilhelm II received the land as a gift from the Turkish Sultan Abed Abdul Hamid II during his visit to Israel in 1989. We remember the historic visit mainly because of Herzl, who tried to meet the Kaiser during his visit. The church was inaugurated in 1909. A nice café and a souvenir shop (along with public toilets) greet the visitors entering through the church gates.A turn to the left leads to the main hall. The central apse (main chapel) faces east, where the sun rises. There is an impressive mosaic on the floor, three intertwining circles located at its center, symbolizing the Holy Trinity – Father, Son and the Holy Spirit. The stairs lead to the bottom of the church, the Crypt. In the center stands the statue of Mary, and above her are other important women from Bible, such as Ruth the Moabite, Eve, Miriam, Yael the wife of Heber the Kenite, Judith and Delilah holding Samson’s hair. The chapels surrounding the sculpture were donated by different countries, and the Ivory Chapel itself was donated by the Ivory Coast. We shall continue to go East, almost to the end of the wall, and just before the end, look at the wall to your right, and you will see a tombstone with an Armenian inscription, embedded in the wall. The Armenian cemetery will appear to your right, in which Armenians who were slaughtered by the Turks during World War I are also buried. Walking up the stairs will lead you to another cemetery entrance, with a symbol which consists of the letters O and T. The letters mean: “Tafos” – the Holy Sepulchre – the symbol of the Greek orthodox monks who belong to the order of the Holy Sepulchre. On the righthand side of the cemetery gate, is another big structure, an American college. Some say that George Habash, the future president of the Popular Front (and some informed sources also say that the roof of the college reveals an excellent view over the performances taking place at the Sultan’s pool). The stairs lead to a paved road and to the South-West corner of the Old City walls. To the west – the new city will be revealed before you. Below, lies the Valley of Hinnom, the famous biblical spot. Achaz, king of Judeah and the son of Yotam, has sinned a terrible sin and sacrificed his own son here, to the Canaanite god Molech. Today, the Sultan’s Pool is located in the middle of the valley. Although it is well known since the reign of Herod (the Second Temple period) as the “pool of snakes”, the pool got her shape and name from the Ottoman Sultan Suleiman the Magnificent, the man who built the walls of Jerusalem we see today. In the summer, the pool is used for hosting shows, and the Arts and Crafts Fair. Above the Cinematheque and on the other side of the road, is the Scottish Church of St. Andrews, built in 1927, and nearby – the British Consulate. The Scottish building has a strange and surreal story: In 1987, an education officer from the IDF walked in the church with her soldiers. She thought the roof was a good observation spot and climbed on it. As she was coming down, she was arrested by two consulate guards who accused her of a military invasion to Scotland. The Consulate next to the church is considered an ex-territorial space belonging to Britain. The incident, by the way, had a happy ending and everybody returned home safely. Did it really happen? That is unknown, but that’s how urban legends appear, apparently. The church was built by Scottish pilgrims for other crusaders. The Hollywood version tells that the Scottish king Robert Bruce (an historical figure that appears in the movie “Braveheart” starring Mel Gibson) asked on his deathbed to bury his heart at the Church of the Holy Sepulchre in Jerusalem. Looking high beyond the Sultan’s Pool, you can see Mishkenot Sha’ananim and the windmill of Montefiore. Mishkenot Sha'ananim was built in 1859 by the funds of Moshe Montefiore. Yamin Moshe, located next to it, standing out with its red roofs was built in the memory of Montefiore in the last decade of the 19th century. On the right is the YMCA tower and the King David Hotel. The paved path leads North towards the Tower of David. A careful look at the walls reveals three different sections: the first part of the wall is clean and blooming. A little further, half of the wall is covered with weeds, and towards the end, it is partly covered with lumpy dirt. The covered part is a remnant of the wall during the Jordanian rule, when the walls were covered with dirt. The project of exposing and cleaning the wall after the Six Day War was initiated by Teddy Kollek. Across the road, to the West, where Mamilla neighborhood used to be, is now the Kfar David neighborhood. It was founded in the 90’s and it is considered as one of the most expensive in Israel. The pavement leads us to Jaffa Gate. 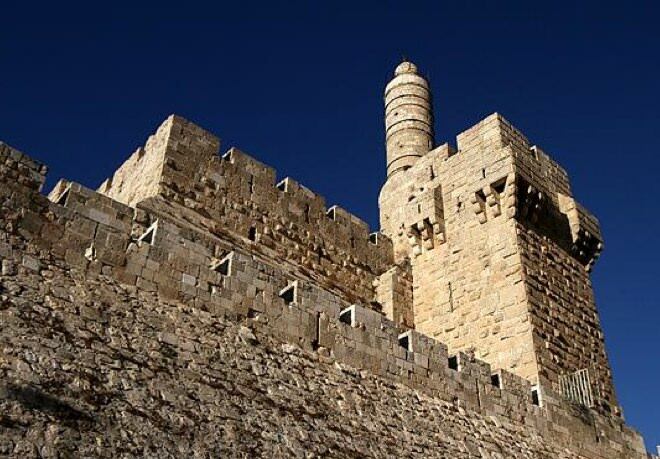 To the right we have the Tower of David, one of Jerusalem’s symbols. The citadel is located on the highest point of the Old City. King David, the one after whom the building was named, has never actually been here, neither did he build this place. The citadel was built by Herod in the first century BC, almost 1000 years after David’s life. The size and glory of the citadel had convinced Titus, the destroyer of Jerusalem at year 70 AD, to keep it intact. The story was mixed up by other pilgrims and rulers later on (probably in the crusading period) and attributed the fort to King David. Today the fort is used mostly as a museum of Jerusalem’s History. The Jaffa Gate symbolized the main road from Jerusalem to Jaffa for thousands of years. The route passed through the current Jaffa Street, South towards Ramla and Rishon-le-Tzion, through the current army base of Tzrifin, then to Jerusalem Boulevard in Jaffa, and finally to the Jerusalem Gate in Old Jaffa. Next to its practical name, the gate had many names through history, including David's Gate, Bab al-Machrab Daud (The gate of David’s Opening Prayer in Arabic) which was prevalent during the Middle Ages, and Bab Al-Chalil – The nickname of Abraham and also of Hebron, which was the destination of the road from the gate. There are two ceramic plaques hanging on the left side of the gate. They tell the history of the city during the last century. The lower one is divided in two: in English and Arabic, the languages used by the Turks, which indicates that the sign is from 1917 or earlier. Its upper part, that appears to be a late addition, is in Hebrew, and was added after the Six Day War. 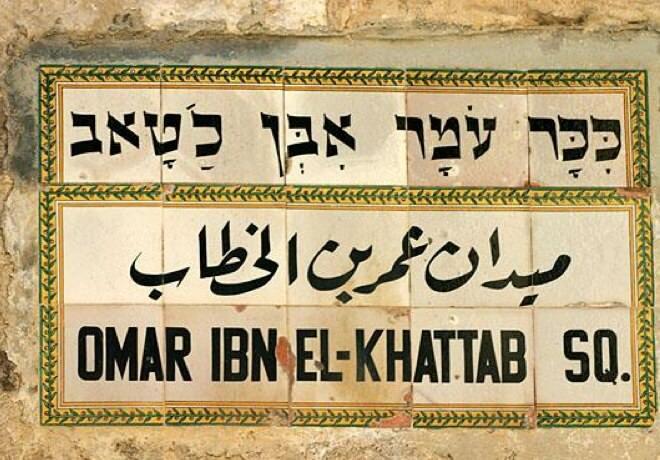 The linking period, the British Mandate, is presented in the second sign, the upper one, which is written in English, Arabic and Hebrew. In the Old City, near the gate, you can snack on a little bagel, Knafeh or blancmange.